So Many Stamps So Little Time: Papertrey Ink Anniversary Day #8 - Watercolors! Hello! Today I am back again with a set of cards I created using a watercoloring technique, which is what Nicole challenged us to create for today's Papertrey Ink Anniversary Day #8 Challenge! I am in LOVE with this technique, and I hope you will try it once you see just how easy it is! 1. Find a wide piece of lace. The larger the eyelet holes the better. 2. 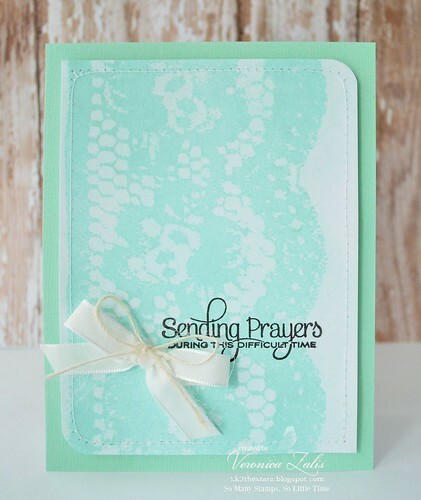 Attach the lace to your card base (I used PTI Stampers Select white) as tight as you can by taping it to the back of your card base. 4. 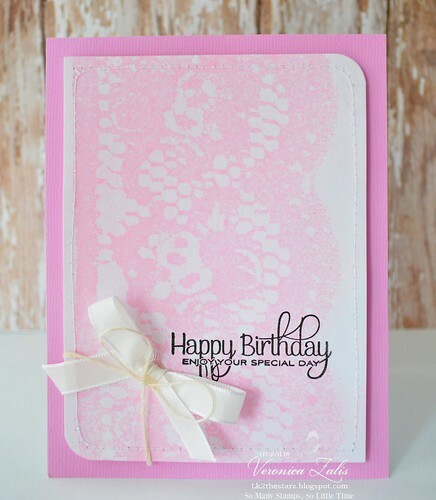 Spray the card liberally with the water based spray mist of your choice. I used Tattered Angels. Wipe away the excess mist and set aside to dry. I repeated the same process for the next 2 cards. 5. Allow to dry for an hour or so. Finally add your sentiment, my sentiments are from the PTI set "Beautiful Butterflies". I added machine stitching, and ribbon, and a button to each card. I. Love. These. Cards!! What a great technique and truly pretty cards! The colors you chose are so happy and the finishing touches are a delight. I will also soon be a new follower. wow those colors are gorgeous...i must get some of that pretty card-stock... Lovely cards..
Wow wow wow!! What a beautiful set and great technique! !